Well, two days ago it was cold and miserable in Maine, so I started making a list of rainy-day things to indulge in, but today it is really looking spectacular. Blue sky, daffodils blooming outside the window, and a warm glare against my computer screen. Yay spring! The road trip has officially ended, but we are still in limbo about where we’re living and what we’re doing. Actually, I kind of like it. I don’t think I’m ready to settle just yet. For now we are still nomads, we’ve just moved into a house for the time being. The good thing about this is that I can get back to my preferred cooking habits. The remnants of my grandmother’s garden are still in the back field, and lucky for me are showing the first signs of asparagus and rhubarb. 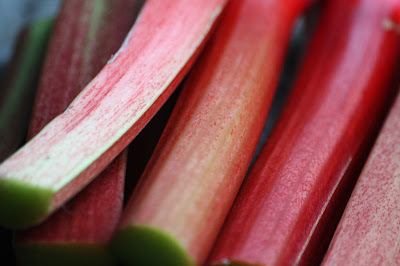 I’ve been experimenting with crumbles but haven’t found anything I like to do better with rhubarb than this super-easy baked version (that I think I read about in The Guardian once upon a time), plus a little vanilla ice cream of course. My cousin has been sharing his hens’ fresh eggs with us, and I have discovered (well, maybe I’m not the only one. It was printed in the New York Times) a no-knead bread recipe that I mix up every night and bake off every morning. The fact that my grandmother’s old oven only gets to 300 degrees when it’s been on for over an hour only makes it that much more exciting to try and guess the cooking times. At least nothing’s in danger of burning. So, poached eggs (and asparagus!?) on freshly baked toast is sounding extra good right now.